On Halloween, we went to our neighbors' house for dinner. Tracy served us a delicious beef stew. I ate two bowls. It was perfect for a cold, wet night! Well, I couldn't stop thinking about it. So, of course I had to try and recreate it! LOL One of the things she did, I've never thought of. She told me she left the roast whole as it cooked, then cut it up. So, I tried it! Wow!!! The meat was so tender and juicy!!! Let's face it, sometimes the beef in stew can be "tough." This was FAR from tough! The exact opposite actually. 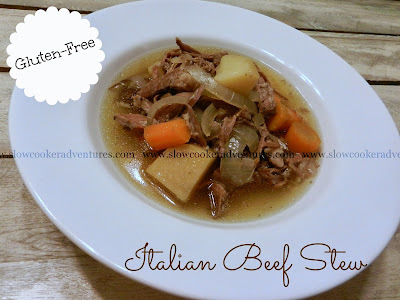 I don't think I'll ever made been stew with "stew meat" again! Now, gather up those few simple ingredients and get that crock a cookin'!!!! Place the roast in your slow cooker. Add in the onions, potatoes and carrots. Next, add in all the spices. Lastly, add the broth and water. Cook on LOW for 10 hours, or on HIGH for 5 hours. Take the roast out and chop/shred it, then place it back into the broth and veggies. OOh! I've never cooked duck, but that sounds amazing! We are trying this tonight for my hubby's birthday! I must have a smaller slow cooker though because I couldn't add all the water or potatoes. But it smells delish!